Preheat the oven to 175° C. Clean and cut the cauliflower into small floretts, place them on an oven tray. Drizzle the floretts with olive oil, and sprinkle sea salt flakes on the top. Bake for approx. 20-25 minutes until they start to golden. 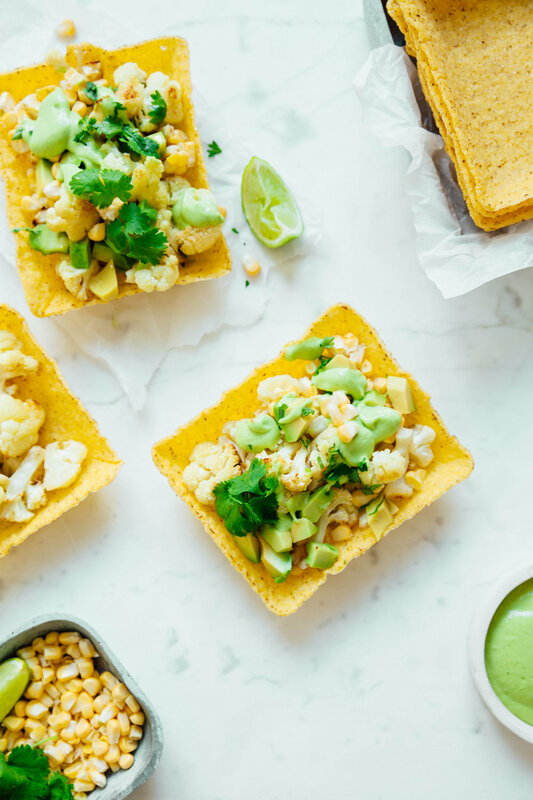 Meanwhile, chop the avocado, corn and prepare the green sauce. To make the green sauce, place the herbs in a food processor or blender and chop. Add the rest of the ingredients and mix on high speed until smooth. 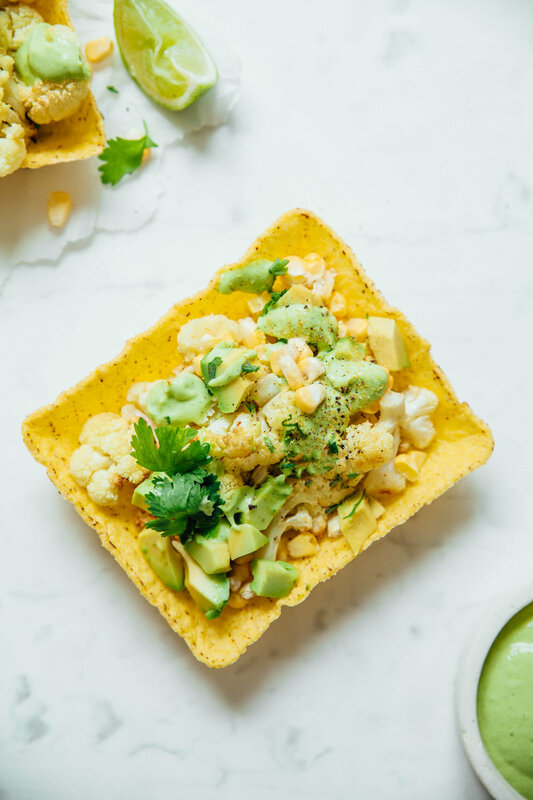 Prepare the tacos by adding some roasted cauliflower, avocado, corn, a couple of spoons of green sauce and top them with some extra fresh herbs. Preheat the oven to 200 °C. Clean the sweet potatoes under water and cut them first into halves and then slice the surface of them vertically and horizontally. Chop the parsley leaves in a small bowl, add the oil, garlic powder, sesame seeds sea salt, black pepper and chili flakes, combine together. Brush the sweet potatoes with the marinated oil. Bake in the oven for approx. 20 minutes. * You can serve the roasted sweet potatoes with some bean salad on the side. Place 1 1/2 cup of the chickpea cans in a blender or use a hand mixer or blender. Add the lemon juice, tahina, cumin powder, garlic, sea salt and a healthy amount of olive oil. Add the water a bit at the time, we want to make a creamy texture, not too liquid! Clean and slice the radishes. Place the creamy hummus on a plate or tray, spread the rest of the chickpeas on the top, the radishes, fresh herbs, seeds... and sprinkle a bit of cayenne powder on top. * Delicious to serve with some roasted rye bread toast.